Indulge yourself in panoramic views of the Gulf of Mexico from your private balcony. Enjoy our heated pool, hot tub, seasonal beach bar and over 650 feet of beach on emerald Gulf waters, just steps from your door. The Osprey On The Gulf is the perfect spot for vacationers looking for the beauty, tranquility, and atmosphere we offer. We’re 1/4 miles from Pier Park, 1 mile from Frank Brown Park & close to many other Panama City Beach hot spots. Here at The Osprey On The Gulf, you can choose from an efficiency or suite. All rooms offer large private balconies fully equipped kitchens with queen double or king sized beds. 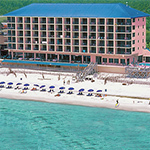 Whether you stay a day, week, or month, you are sure to count your stay at The Osprey On The Gulf among your favorites.